If you made this story up, you’d be laughed out of the room. Identical twins are born six minutes apart in a northern Swedish town where the winter sun barely winks at the day. They excel at sports, all sports, not just hockey, but only after their homework is done. Driven by two older brothers who encourage them to join in on road hockey under the streetlights, they are soon playing organized games above their age level, separated on the ice for the only time in their lives for the simple reason that they are the two best players and both want to play the same position: centre. At 18, the identical twins from Ornskoldsvik are drafted together into the NHL through a deft sleight-of-hand move by then Vancouver Canucks general manager Brian Burke. They are taken second and third in a draft in which the player taken first, by a team that no longer exists, becomes a trivia answer (Patrik Stefan, Atlanta Thrashers). Stefan was a draft pick who never worked out. The Sedin twins, however, work out splendidly, creating parallel universes in Vancouver that ran for 17 seasons. Henrik and Daniel have the same successes – an Art Ross Trophy each as the league’s leading scorer – and share the same failure: coming up one victory short against the Boston Bruins in the 2011 Stanley Cup final. 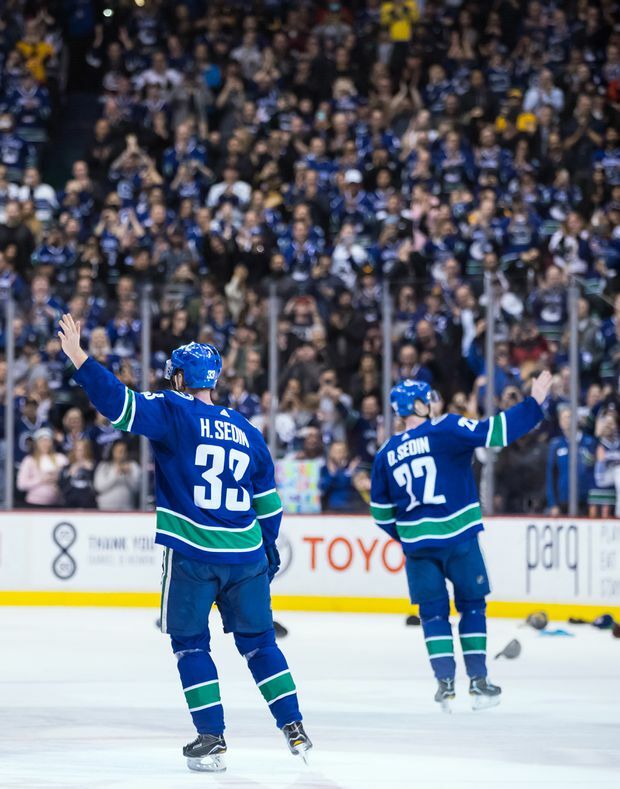 Henrik and Daniel Sedin wave to the crowd after defeating the Arizona Coyotes 4-3 in Vancouver on Thursday, April 5, 2018. They play their entire careers for the team that drafted them – virtually unheard of in modern hockey. They room on the road. They drive to practice and home games together. The Canucks mixed up their names at their very first news conference. Nearly two decades later reporters were still confusing them in the dressing room. They marry and soon had families: Henrik and Johanna with two children, Daniel and Marinette, disrupting the symmetry with three. Still numbered among their team’s top three scorers, they could easily have gone on well past the age of 37, but chose to go out before shelf-life caught up to them, just as hockey icons such as Jean Béliveau and Wayne Gretzky wisely chose to do decades earlier. Appropriately, given their draft order, they wore numbers 22 and 33, the elder twin the captain, the younger one an assistant. Henrik, the elder, sets the goals up; Daniel, the younger, scores them. Their final statistics are so close as to be mind-boggling; more than 1,000 games each, more than 1,000 points each. They won an Olympic gold medal and a world championship for their country. But it is as Vancouver Canucks they will be remembered when they reach the Hockey Hall of Fame. In the final NHL game they will ever play in Vancouver, the Canucks defeated the Arizona Coyotes 4-3 in overtime, the winning goal coming off a Henrik pass to Daniel, who snapped a quick shot home and stopped the clock at 2:33. The place goes wild. The crowd roars, their Canucks teammates mob the twins, the defeated team lines up to shake their hands. It is the perfect ending to a story so rich it has to be made up. Despite the failing of the Canucks to reach the postseason, the level of vitriol and venom found in other Canadian cities missing the playoffs – Fire the general manager in Montreal and Edmonton! Fire the coach in Calgary! Fire the owner in Ottawa! – was curiously absent in Vancouver. Instead, there was a love-in the likes of which have has rarely been seen in hockey. The Vancouver airport even released an urgent travel notice: “Heavy precipitation expected in Vancouver tonight due to excessive tears falling while Daniel and Henrik play their last home game for the @Canucks. Airport operations should be normal, but may be some misty eyes in the building. #ThankYouSedins." Players, teammates, former coaches all had nothing but praise. Modern Swedish stars such as Tampa Bay’s Victor Hedman and Ottawa’s Erik Karlsson said they were heroes who inspired them to take up the game and stick with it. Long-time columnists and commentators could not say enough about the twins, endlessly remarking on their decency, their professionalism, their generous community involvement, their sunny outlooks even when, as invariably happens when a game is taken for religion, the worshippers curse them and blame them for every sparrow that falls and every puck that doesn’t go where it’s wished. So many pucks did not go in, or did not stay out, for Vancouver this year that the team will end a miserable year in second-last place in the Western Conference. And yet, unlike disappointed and even angry fans in Montreal, Edmonton and Ottawa, fans in Vancouver chose to end the season looking back with appreciation rather than blame. 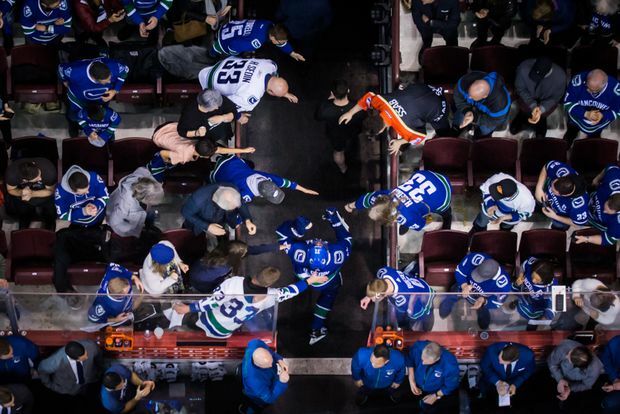 Daniel Sedin greets fans as he leaves the ice after his final home game in Vancouver. If the final script seemed heavy-handed, it was entirely by accident. So delighted with this final game were the Vancouver fans that they blew the 50/50 draw past the million-dollar mark. Henrik, the playmaker, set up Daniel, the scorer, for two goals, including the winner, and the fans poured hats down onto the ice even thought it was not quite a hattrick. It marked the 744th time the twins were involved in the same goal, the only pair to do better, 764 times, was the combination of Gretzky and Jari Kurri. Rather than name the game’s three stars, as is traditional, they picked only one: the Sedin twins. And when the cheering died down, the players left the ice and the crowd headed out into the night, someone left a hand-lettered sign in the seats that said it all in two simple words. 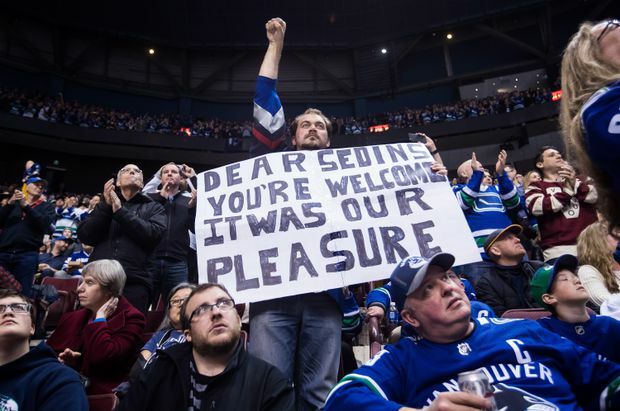 A fan holds a sign thanking the Sedin twins during their final home game in Vancouver.